Reports have been great over the past week. The Eucumbene River is looking great at the moment and with plenty of water coming in we should start to see a lake that will stabilise and rise well for Spring. The dam wall is also an option for some polaroiding when conditions are clear and bright. Lake Jindabyne:- Jindabyne reports have been a little better with some polaroiding. From reports to hand there are not big numbers yet, though there can be some good fishing if you cover enough ground and find them. The weather this week is looking good so if tou get a leave pass from work it would be worth the trip. 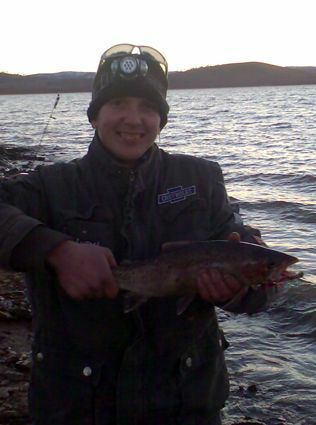 *Rob Gadson from Jindabyne had a quick fish early last week and landed two brook trout. One was a little tacker and the other near a kilo. A bead head wooly bugger did the trick. 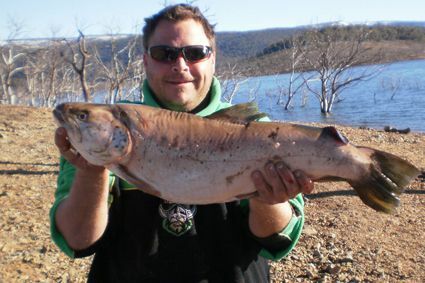 Eucumbene:- Eucumbene trolling reports have been quiet this week though there are some good fish to be caught. *Hi Tom, just thought I'd send you a photo of a brown trout caught by Vitda Pangnanouvong out here last Sunday. Fish was taken on a lump of green power bait found at the side of the lake. It weighed 2.84kg. Hit Seven Gates Saturday night with two mates. We picked up two really nice browns that were identical in size with both being caught on Powerbait. Mine on orange pulp and my mate Jeff got his on pink sherbet. 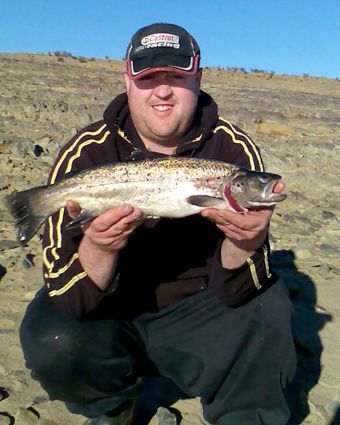 My other mate Dave got a nice rainbow also picked up on sherbert powerbait. It was a nice cold night with plenty of wind blowing straight off the snow that was on the hills, but otherwise it was a beautiful night. All up two nice browns and four rainbows. Neil Dean, Jeff Yang and Dave Tailor. 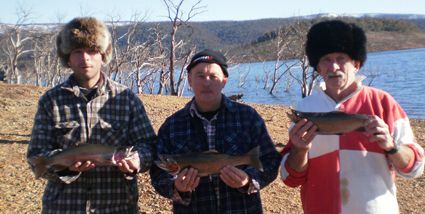 I fished Eucumbene Cove with my father Col and mate Dan on the weekend. We caught 13 fish, three trolling and the rest off the bank. The fish off the bank were all caught on power bait. Most of them on a combination of two different coloured nuggets on the same hook. All colours seemed to work except chunky cheese! The fish were taken at all times of the day with the bites being very finicky. We would here a rattle on one rod then catch a fish on another! Most were rainbows of around two pounds although we bumped into some blokes called Sean and Mick who had caught the biggest brown trout I have ever seen! 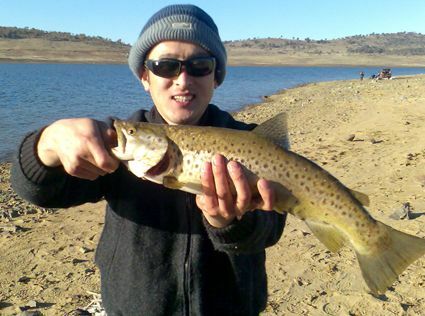 Jindabyne reports were better this week. Went on our annual snow trip during the school holidays and as usual I fished various spots on Lake Jindabyne, mainly Creel Bay and Rushes Bay. The fishing was a lot slower than this time last year as I had clear sunny days with no wind. However, my son and I still managed to catch some quality fish, especially on lures. Using Ecogear VX40 and VX45 blade vibes we caught some thumper browns ranging between 4-6 lb to 65cm. We caught some rainbows and a brook trout on powerbait but they were only around 2-3 lb. Orange Pulp Gulp was the most productive of the powerbaits. The only fish that fell to lures were the browns. All in all, a good trip.